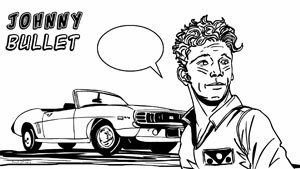 Mystery Inc. attends a detective convention, where they are faced two immediate problems: how to blend in (a solution I greatly appreciate), and who stole the memorabilia (a solution I find far less satisfying). I found the mystery featured in this particular story rather weak, and the secondary characters seemed to have been inserted into the story with little cause. I got the impression somebody won a contest, and this story was constructed around them to fulfill an obligation. The person hosting the mystery convention is depicted as Asian, suggesting an idea to me. In the early 1970s, Scooby-Doo’s success led to a number of imitators: the Amazing Chan and the Chan Clan, Wheelie and the Chopper Bunch, and the Funky Phantom. I’d love to see the Scoobies meet up with their Hanna-Barbera siblings, but perhaps that’s an idea for another comic book. Thanks to the Edgar Allan Poe reference in the first story, we are treated to a four-page interpretation of Poe’s The Raven, brought to you by Norville “Shaggy” Rogers. This is followed by what may be a story in which the Scoobie’s investigate a mysterious witch doctor terorrorizing a surfing competition. A date of 2009 in a banner in the background suggest the story might be a re-run. I don’t mind re-runs so much. 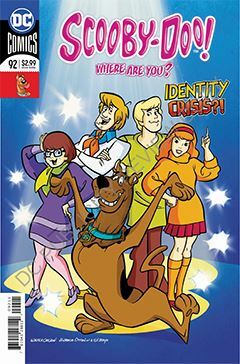 They were a staple of Saturday mornings when I was a child, and it’s very likely anyone who read Scooby-Doo in 2009 isn’t reading it now. I just wish the DC Comics production department had the sense to make that adjustment 9 years later. No biggie that they didn’t, but it makes me wonder how much they’re paying attention. I know I’m picking nits, and it doesn’t take away form my enjoyment of the story, however minimal it may be.